How often we hear this clichéd line espoused by those who have come into the new year with fresh hopes for righting wrongs, picking up healthier habits, and for bettering themselves by measuring up against whatever definition they so choose. A platform is no different. Sure, the site itself has grown tremendously in its current state. We have been featured in major publications. We have completed over 6,000 transactions in over 125 different companies. And those that were with us on Thanksgiving know that we have doubled our headcount and look to continue on that trajectory over the next twelve months. But there’s always room for improvement. And given one of the driving missions of EquityZen is to educate the public on the private markets, we decided that there was no better place to start than our Knowledge Center. A universal search? Check. A sleek new design? We got you. New features to explore? You betcha. Strap in your seatbelts, ladies and gentlemen, and get ready to joyride through our brand-new Knowledge Center. That’s right, folks. We gave this page a complete makeover, moving away from the long lists and block text, and instead choosing a more visually stimulating design that cleanly outlines the many exciting and informative options users have to choose from. Our Overview page is broken out into four sections: the Pre-IPO Investor Starter Kit, Research Materials, Content Center, and a new section called “What We Are Reading.” This new addition provides a window for you, the user, to view the articles our team is focusing their attention on in order to keep a pulse on the finance and tech worlds alike. 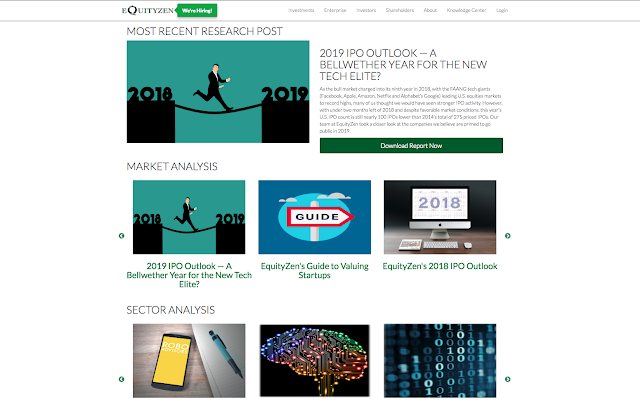 Fan favorites like the Path to IPO and the EquityZen Market Sentiment Index can all be found directly from the Overview page of the Knowledge Center. One point of emphasis for this remodel was to bring to the pieces of content users would most care about to the forefront. When we pored over the data to see what it is our users were most interested in and most vocal about, the answer was clear: our private markets research reports. These analyses are featured prominently throughout the industry, often appearing on publications like Yahoo! Finance, Bloomberg, and CNBC. 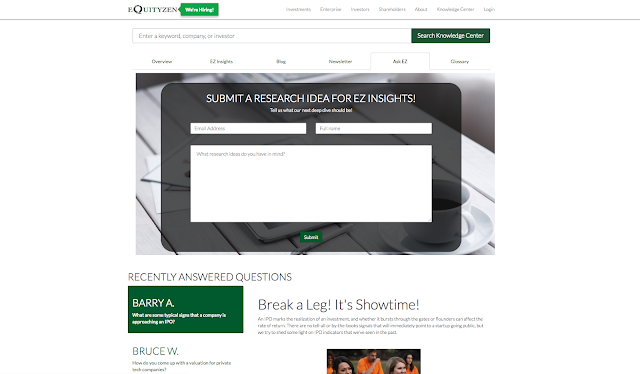 Thusly, we built in the EZ Insights section. Our Research Team works hard to bring cutting edge insights to those seeking more wisdom about this space. Now, it’s easier than ever to browse through that analysis, find the most recent or most relevant pieces, and download them directly without jumping through any hoops. Additionally, we have classified each of these reports into different subgroups of analysis. Those groupings are Market, Sector, Company, and Founder. Each time we put out a new report, you will see it featured up at the top, as well as placed into the corresponding bucket. Have you ever been browsing through TechCrunch, or Axios, or perhaps daydreaming off the coast of St. Lucia and thought to yourself, “I wonder what steps would be necessary for a large public company to be taken private?” (Yes, these are the things EquityZen team members find themselves daydreaming about; yes, we’re proud of this). Though the usual spots like Quora or Investopedia may have solid answers for certain questions, there are plenty of smaller questions that do not (and likely have not) translate into large think-pieces or lengthy research reports. However, it would still ease your mind to have an expert in this area to answer your question. Well, fear not, for now you can Ask EZ! In this new section of the Knowledge Center, users can write in the topics, questions, and general curiosities they’d like to hear our private market experts opine on and/or provide some clarity. While they cannot answer every question asked, our Research Team will be dedicating time each week to answering the most intriguing, informative, and entertaining inquiries. This makes our process more interactive, allowing our tremendously educated and inquisitive user base the ability to push the dialogue and research forward. Start writing in your questions and Ask EZ today! We encourage you to check out this new Knowledge Center and utilize the many resources we continue to cultivate and update for you. Our mission is to bring the private markets to the public, with educating the masses as a key tenet in our journey towards doing so. With this newly redesigned and strengthened Knowledge Center, we hope that you are empowered to explore the world of private markets, of pre-IPO tech, and of EquityZen. It’s like we said: new year, new KC.